Built somewhere between 1827-33, this disused chapel is part of a complex of almshouses in Peckham, South East London that was left in disarray. The inside of the ‘Asylum’ (meaning sanctuary) was stripped by an explosive device dropped during World War Two but astonishingly the amazing stained glass windows remained intact! Nowadays the chapel is leased by a couple of artists who use the space for exhibitions, art projects, weddings and other events. Opened in 1907, under the name ‘Strand’, Aldwych underground station was a terminus for a branch of the Piccadilly line. The station was in use, despite low-traffic- until 1940 when it became a bomb-shelter during the war. It reopened in 1946 after the war and remained open until 1994 despite dwindling numbers due to other stations opening around it. These days it’s used as a tube station in a number of Film and TV shows and TFL offer tours around this disused station every now and again. In another rail related abandonment, London is home to one of the stranger and darker stations. Waterloo station once ran a special line straight to Brookwood cemetery – it allowed the deceased and their mourners to travel straight from central London to the cemetery to be laid to rest. Started as an answer to the rising public health concerns in London after it’s first cholera epidemic the station had two sections, one for Anglican users and one for ‘Nonconformists’. Key in this religious time. The station was bombed in 1941 but the facade still stands. 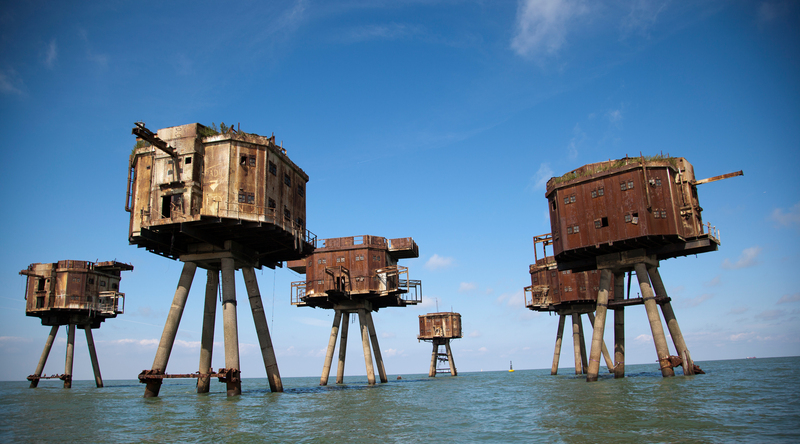 These disused armed towers out in the Thames estuary were decommissioned in the 1950s but are still standing to this day. Built in the early 1940’s as part of the war effort the forts were there to fight off both naval and air forces coming over from Germany. After being decommissioned the forts were snapped up as the perfect place to set up pirate radio stations that were huge throughout the middle of the 20th century. Pirate radio brought cutting edge music to the ‘teenagers’ of the day that mainstream radio providers such as the BBC wouldn’t play due to strict broadcasting rules. One of the towers now houses what claims to be an independent micronation ‘The Principality of Sealand’ which is supposedly the worlds smallest nation! This abandoned water pumping station is East London is perhaps the most picturesque on our list. Described as ‘The Cathedral of Sewage’ Abbey Mills was built in in the lat 1880’s had two engines on each arm of a cruciform plan that lead to this name. The building is now grade 2 listed but you can easily see that some of the areas have been left in disarray after the new pump house was built a couple of hundred metres down the road. 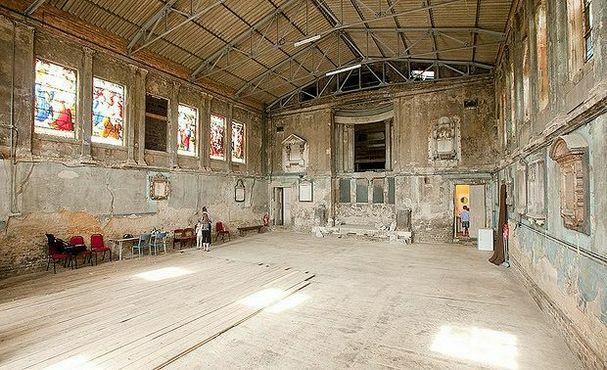 Got any other abandoned places in London you think we could add to this list? Drop us a comment below and let us know. Head to our guides section to find more articles like this! How easy is it to get permission to photograph abandoned buildings and who do you approach for permission. I was at asylum chapel last weekend for a wedding. So beautiful! Such a shame they are not reused for something useful simple living accommodation perhaps. What about the Millennium Mills? I think it’s probably going to be refurbished soon if the work hasn’t started already. Hi! Is it possible to just go and take pictures/film for non-commercial purposes? Next Next post: The 5 best cities to live in across the world 2018!